Do you have a goal you want to work towards? 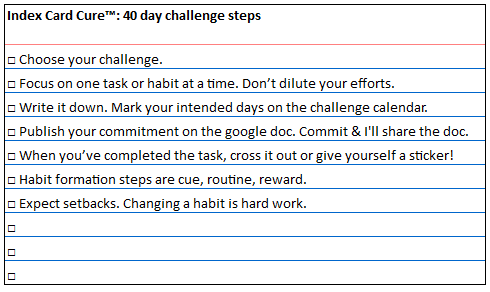 Has something been nagging, “I really should…” What can you accomplish in 40 days? This is an opportunity to challenge yourself with the possibilities. Why 40? 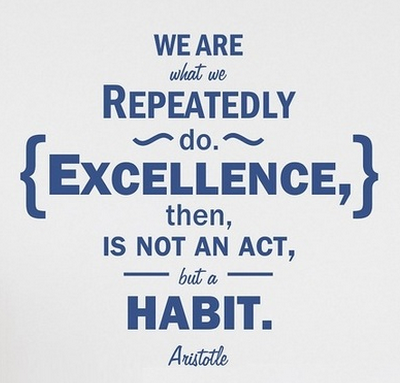 You may have heard that it takes 21 days to change a behavior, but research indicates it takes most people 2 or 3 times that amount of time to instill a habit. This challenge uses 40 days. In religious stories, 40 is a number of waiting, preparation, or testing. Lent is 40 days; Jesus spent 40 days in the desert; it rained for 40 days and nights. The number 40 represents the starts of a new chapter which is what you are choosing by committing to this challenge. To give some breathing room, the challenge is five days per week for 8 weeks. Bingo gives one free space; Sunday is a bonus day in Lent, but the Equinox Challenge allows more flexibility with two free days, allowing you to work around your travel schedule and other commitments. So what does the challenge entail? Identify one baby step goal. Choose something small enough that you aren’t overwhelmed, freaked out or discouraged. Pace yourself. It takes a lot of training miles before you can run and finish a marathon. Even if you have multiple goals, work on one thing at a time. Set yourself up for success. Make sure your challenge goal is SMART. SMART is a goal setting acronym that will help you to craft an achievable goal. Your goal can come from any category: health, wellness, lifestyle, spirituality, adventure, money, career, etc., but refine your selection to make sure it is SMART. If you choose to participate, I will share a google doc for the challenge participants. It will be a private forum for those who are working on their goals. Whether you join, post, or work on your goal is up to you, but public commitment and tracking help reinforce goal accomplishment. Monday, 22 September is the start of Fall. Are you ready to challenge yourself? Life is always going to fill your schedule. Can you spare 5-15 minutes/day five days a week for you? At the end of the challenge period, you’ll be eight weeks older. Will you be eight weeks closer to your goals? Take this opportunity to grow. September 22, 2014 in Need-to-know.